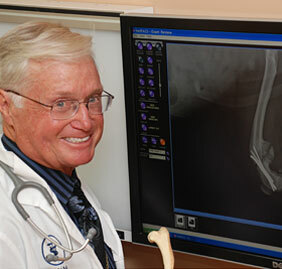 Dr. Eric Winchester, Sr., graduated from Auburn University Veterinary School in 1972. He and his wife Janis opened Julington Creek Animal Hospital in 1975, as a combined practice for both large and small animals. As Mandarin grew, so did the small pet population. Julington Creek Animal Hospital shifted its focus to an exclusively small animal practice in the mid 1980’s. Dr. Winchester has dedicated his life to the health and well being of his patients. Because of this, his practice has grown to 5 veterinarians and now includes the 106 suite boarding facility and animal park, Julington Creek Animal Walk. In 1998, Dr. Winchester’s son, Dr. Rod, joined the practice. They work as a team with Dr. Jack Cahill, Dr. Zuleika Cotto-Carballo and Dr. Maria del Mar Guzman to ensure your pet receives the best possible care.